When I visited Mexico City for the first time, the place I wanted to see more than any other was Frida Kahlo's house in Coyoacán — the Casa Azul. Since that trip, Casa Azul (Museo Frida Kahlo) has been spruced up, and hidden wonders within its walls discovered: many of Kahlo's fantastic clothes and other personal belongings — hairbrushes, decorated (and bloodied) orthopedic corsets she used after her many spinal surgeries, Kahlo's prosthetic leg, sunglasses, lipstick, nail polish (Revlon's vibrant red "Orchids to You")...and perfume. My first gallery talk at the Seattle Art Museum was on Frida Kahlo in an exhibit titled Mexican Modernism. I was lucky I could look at some of her most amazing works up close for over three months and share my passion for her art and life with visitors. At the end of the exhibit, I was depressed. Would I ever see those paintings again (they were part of a famous private collection)? As I started my car in the museum garage after giving my last Kahlo tour, I shouted out: "Goodbye, Frida! It was wonderful to see you!" The moment the words came out of my mouth, my car's interior light, which had not worked for two years, came on. Of course, I interpreted this as Frida's personal response. After I saw a photograph of Kahlo's empty Emir bottle, I went to eBay and said: "Frida, I want some Emir!" And there it was, a small bottle of Emir Parfum from the 1950s ("unopened, in original packaging"). I clicked "BUY IT NOW", and here's Emir's story. The Dana perfume house was founded by Javier Serra in Barcelona, Spain, but relocated to Paris after its debut release: Tabu, in 1932. For many decades, you'd find Dana fragrances in stores like Saks Fifth Avenue, not Walgreens.2 Inspired by Persia, Emir was developed by perfumer Jean Carles and released in Europe in 1936, but didn't find its way to the US till after World War II (it debuted here in 1947). Looking at the Emir advertisements, I imagined Emir's "exotic" appeal to an over-the-top personality like Kahlo, who dressed (and painted herself) in fabulous "costumes" and dramatic jewelry. Judging by its packaging, my bottle of Emir parfum is between 60 and 65 years old, but it smells surprisingly fresh. The perfume opens with vibrant floral-fruity aldehydes (rather peach-y in character). Quickly, Emir caramelizes its opening accord and I begin to smell an incense and immortelle-like combo; then, abruptly, a smooth leather scent is added to the mix. The heart notes of Emir are dusky and musky with glints of syrupy rose and jasmine. As Emir heads to its conclusion, I smell a floral-tinged, powdery amber accord that includes dusty, singed spices (clove-cinnamon). Surprisingly, Emir's longest-lasting phase comes late: a mossy, dainty rose-jasmine accord, a scent so clean and "pure" it could be worn by a child. I can easily imagine Kahlo wafting a strong dose of Emir as she walked about in her flouncy skirts and rebozos. Kahlo was a dog lover, and I bet her adored Xoloitzcuintles smelled faintly of Emir after receiving hugs or napping with their mistress; perhaps her husband, Diego Rivera, put a drop or two of Emir on his neck or wrists to remind him of Frida. The rest of the Emir-Kahlo story is a mystery. Did she buy many bottles of Emir...or just the one large bottle found in her possessions at Casa Azul? Was Emir a gift? Kahlo wore Schiaparelli Shocking, too (she must have been a Jean Carles fan-girl); did she love Shocking more than Emir? Was she a perfume loyalist or was she promiscuous with perfume like most of us reading Now Smell This? Dana Emir was "retired" in the mid-1970s, but if you search online, you can find vintage bottles for sale around the world. Since I knew nothing about Emir till a few weeks ago, I'm thrilled Kahlo introduced me to it and that it was a happy experience. Now to drape an Emir-dabbed handkerchief over a large poster I own of a Kahlo self-portrait. I'll let you know if Frida has anything to "say" about it! For those lucky enough to be in New York City before Nov. 1, 2015, check out Frida Kahlo: Art | Garden | Life at The New York Botanical Garden. To view Kahlo's Emir bottle and other personal items discovered in her home, look here. 2. Dana has changed hands numerous times, and the company is now known as Dana Classic Fragrances. Note: Top image is Frida Kahlo, June 15, 1919, by her father, Guillermo Kahlo [cropped] via Wikimedia Commons. 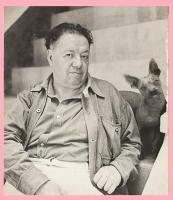 Bottom image is Diego Rivera with a Xoloitzcuintle dog in the Blue House, Coyoacán via Wikimedia Commons. Spooky! I have had a similar experience “talking” to Gram Parsons that I interpreted as him actually having heard me. “Emir” seems like it would be very popular now, of course they would have to release an “Oud Emir” flanker! Kevin: what a great story and experience! There is so much value in learning about these classic fragrances and the people who wore them. Frida Kahlo’s art is amazing, so this whole post was very exciting to read. It would be really interesting to know if the Emir was a gift from one of her lovers! Ann…if only bottles could speak…. I think about that a lot in the past when I’ve bough used and decades old bottles of Chanel No 5 on ebay. What’s their story? Who was the woman who owned it? So interesting to speculate! Thank you for the lovely story and review. During the 1987 Pan American Games in Indianapolis, the Indianapolis Art Museum had an exhibition of Pan American art including a large number of Kahlo works. I wet to that exhibition half a dozen times while it was open. While I loved Kahlo, it was Anita Malfatti and Tarsila do Amaral that stole my heart. I am off to snag a sample of Emir. I wonder if I can find out what Anita Malfatti and Tarsila wore? There is a Tarsila perfume–Rouge! Thank you for this post and your experience with Kahlo. Kevin, this is such a fantastic read and a fascinating glimpse into Kahlo’s personal life and your own. I’m glad that she spoke to you, and that Emir does as well. Kevin, your reviews never fail to make me smile! Thanks for the great post and link, Kevin! I love those sunglasses, too, especially imagining the gilded tops with the little horns and the famous unibrow. Noz…those sunglasses are wild…don’t think I have ever seen a photo of Kahlo in sunglasses. Lovely, beautiful story. Made my night. Wish it could be turned into some sort of screenplay for a film directed by the Duplass brothers…. Sabrina…that would be fun, the life of objects! Bravo, Kevin. She will speak to you again, I am sure, but who knows where or when? Donnie: I’m way over due for a trip to Mexico…maybe there! I so enjoyed this! I love the imagery of this scent floating from the folds of Frida’s wraps and skirts. To me, she is endlessly fascinating. It’s fun imagining the perfume predilections of great people of the past. More of these, please! Bookgirl…I have quite a few candidates for posts like this! Great story, beautifully told. Thanks, Kevin. Thank you! My sleeping Art Historian heart opened up like a big, red rose after reading this…..
stinker kit: I should have worn Shocking and Emir as I toured the Kahlo show. HA! Thank you for mention Tabu in your article, Kevin. As I have mentioned on here before, an old friend, sadly no longer with us, wore it when we were all young, free & single – Diane didn’t subscribe to the ‘less is more’ theory, hence someone in our group nicknaming it ‘instant brothel’. Always appreciate it getting a mention, as it brings back such happy memories. Carolyn: I wish I could smell the original Tabu. I’m assuming that what my friend Diane wore was the original, as it was in the early to mid 1970s that we were young, free & single! It was quite pungent, especially in the quantities Diane applied (! ), but a very distinctive smell & it really suited her – one of those relatively rare occurrences, for me anyway, where if I ever smelled it I would immediately think of her – something many friends & colleagues used to say about me & my beloved, much missed Eau de Camille. There’s a B & B on one of the Gulf Islands in B.C. that is a small museum to Frida. Years ago I was visiting the Left Bank with my friend (another perfume lady) who was born in Paris, and we happened upon an art exhibit of Frida Kahlo’s, so we went in. We smelled the most divine fragrance on a lady. We pursued her through the museum until we could stop her and ask what it was. We were astonished to learn that it was pure patchouli because of its negative reputation as a hippy scent. It smelled fabulous! My friend had never heard of Frida so she was quite impressed by the exhibit. Thank you for the article and posting where we could look at the artifacts. That was such a unique and valuable addition. Thanks, Celestia: I’ve done the SAME thing…I think the last time was at the Van Gogh Museum in Amsterdam…the woman was from Indonesia and if I’m remembering correctly it was one of the Bvlgari Omnia perfumes she was wearing…it smelled great on her. Another time I stalked a woman at the museum here in Seattle and it was CK Obsession parfum. Both unexpected answers! Now that was a fantastic review/story, Kevin! Thanks for sharing what Emir smells like. Dusan! You’re welcome…it was a fun review to write. I am reading this just now. I’ve always enjoyed your writing, Kevin, but this tops everything that has gone before! I savored every word. Such a fascinating and enjoyable read. Thank you!